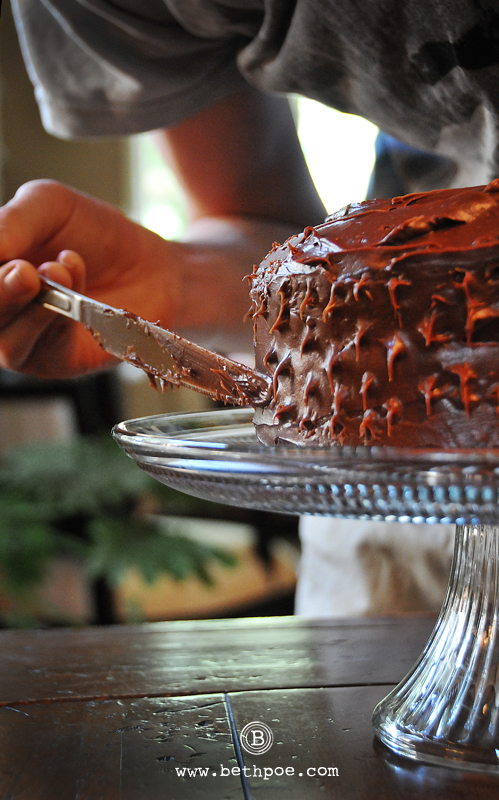 Let’s face it, a nice creamy chocolate cake does a lot for a lot of people. For as long as I can remember my husband has requested ‘Gram’s Lemon Cake’ on his birthday. As a child, he was only able to get this special treat when he visited his Gram, who lived at sea level; You see, the recipe for this lemon cake is very finicky and it does not work well in the high altitude of Colorado. So, ‘Gram’s Lemon Cake’ became a very rare treat indeed. However, many years ago I got hold of the recipe and I worked diligently to convert the recipe so that it would work at high altitude. Many years and many caved-in disasters later, I perfected the recipe and it has been a staple on his birthday ever since. So, you can imagine my surprise when this year he told me that instead of Gram’s cake, he wanted a good old-fashioned, double layer chocolate-on-chocolate cake. At first, I thought he was joking. My kids thought he was joking. Even the dogs thought he was joking. But he wasn’t. And it was his birthday, so we gave him what he wished for. Many thanks to my son who took over the cake making duties for me… you did a fabulous job! Thanks for the comments, Bulldog. For what it’s worth, cake in the morning isn’t such a bad thing. In fact, my husband prefers to eat his cake for breakfast rather than dessert!